In 1877, Georgia was emerging from the federally directed period of Reconstruction that followed the end of the Civil War. Under the terms of Reconstruction, Georgia had adopted a new state constitution in 1868 that was distasteful to many Georgians. Although the delegates to the 1868 State Constitutional Convention had included some antebellum Georgia political leaders, such as General Levi J. Knight, of Berrien County (subject of previous posts), many Georgia natives felt that the drafting of the Constitution of 1868 had been dominated by northern Republicans and northern sympathizers. When the Constitution of 1868 had been completed and the vote came up on the question of its adoption, General Knight was absent and did not vote. As Reconstruction came to a close southern Democrats regained control of the state government and called for a new constitutional convention in 1877. On July 11, 1877, 193 delegates met in Atlanta to draft a new constitution. 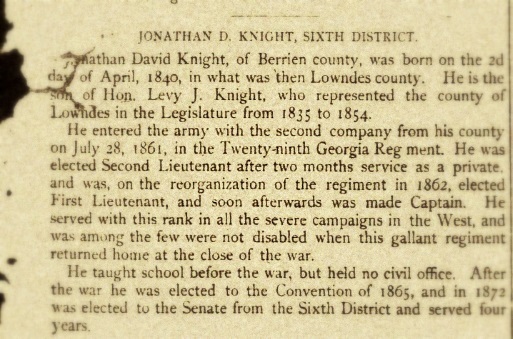 Among them was Jonathan David Knight, a son of General Levi J. Knight, Confederate veteran, and the convention delegate representing Berrien, Lowndes and Clinch counties. He was six feet tall, with fair complexion, light hair and blue eyes. Jonathan D. Knight made his home in the Rays Mill district of Berrien County, GA, the 1144 Georgia Militia District. When the Constitutional Convention adjourned on August 25, his signature was on the new constitution. Georgia voters ratified the new constitution in December of 1877. Jonathan David Knight, of Berrien county, was born on the 2nd day of April, 1840, in what was then Lowndes county. He is the son of Hon. Levy J. Knight, who represented the county of Lowndes in the Legislature from 1835 to 1854. He entered the army with the second company from his county on July 28, 1861, in the Twenty-ninth Georgia Regiment. He was elected Second Lieutenant after two months service as a private, and was, on the reorganization of the regiment in 1862, elected First Lieutenant, and soon afterwards was made Captain. He served with this rank in all the severe campaigns in the West, and was among the few were not disabled when this gallant regiment returned home at the close of the war. He taught school before the war, but held no civil office. After the war he was elected to the Convention of 1865, and in 1872 was elected to the Senate from the Sixth District and served four years. Jonathan D. Knight joined the Berrien County Minute Men, Company C, 29th Georgia Infantry Regiment, as a private on August 1, 1861. He was elected Junior Second Lieutenant of Company D, November 7, 1861. On May 7, 1862 he was elected First Lieutenant while the Berrien Minute Men were stationed at Causton’s Bluff, near Savannah. On this same date, his brother-in-law, James Aaron Knight, enlisted at Smith’s Island and joined Berrien Minute Men Company C.
The officers election of May 7 notwithstanding, Jonathan D. Knight was made Captain on May 13, 1862 This appointment would be officially confirmed by officers’ examination conducted July 1862 at Causton’s Bluff. From November 1862 to December 8, 1862, regimental records note Jonathan D. Knight was present with the Berrien Minute Men at Camp Young and that he was “in arrest.” The records of December 8, also note that he was sick. The charge must have been minor or was dismissed, for in December he was present with the unit at Camp Clingman. Knight did recover and return to his unit. He was captured near Decatur, GA on July 22,1864 and held as a prisoner of war until released at Fort Delaware, DE on June 17,1865. In 1872, the CSA veteran was nominated for State Senator. Under the terms of Reconstruction, this was the first post-war free election of state officers in Georgia. A convention of the Democrats of the above district, was held in Valdosta on the 3d inst., and Capt. J. D. Knight, of Berrien county , was nominated for State Senator. He was elected and served for four years before serving at the Constitutional Convention in 1877. At the conclusion of the convention, he was the 99th representative to sign the new Georgia Constitution. The 115-page constitution written by this convention was approved by the voters and went into effect December 21, 1877. The Georgia Archives provides links to the Preamble, the Bill of Rights (Section I), and nine pages of signatures.